Philip Henry Sheridan by Thomas Buchanan Read, 1871. On October 19, 1864, people throughout the Union learned of General Philip Sheridan's twenty-mile ride from Winchester, Virginia to rally his troops at the Cedar Creek and save his campaign to despoil Virginia's Shenandoah Valley of provisions much needed by the Confederate Army. Two weeks later, they could read poet Thomas Buchanan Read's "Sheridan's Ride," an ode not so much to the general, but to his horse Rienzi, named for the fourteenth century Roman statesman who attempted to liberate that city from feuding aristocratic families. In the poem, Read concluded: "Be it said, in letters bold and bright,/‘Here is the steed that saved the day,/By carrying Sheridan into the fight,/From Winchester, twenty miles away!"" Thomas Buchanan Read, self portrait, 1856. Read was also a painter, and in 1865, the Union League of Philadelphia commissioned him to execute a portrait to accompany his poem. 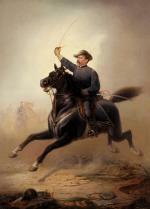 In what is one of the best-known Civil War images, the short general is seen charging on his magnificent black horse, all four of legs off the ground, as eager to enter the fray as his master. Read made several copies of this popular work that circulated as a print throughout the nation. Although Read showed artistic talent as a child, his parents, who lived near Guthriesville in Chester County, Pennsylvania, did not encourage him. At the age of ten, Read ran away to live with a sister in Cincinnati, Ohio. There he worked in a grocery store, made cigars, painted signs and canal boats, engraved tombstones, and used his youthful appearance to play female roles in stage productions. There, too, he began painting portraits, which caught the attention of prominent citizen Nicholas Longworth, who provided Read with a studio and connections to well-to-do patrons. At the age of eighteen, Read achieved fame with his portrait of Presidential candidate William Henry Harrison. 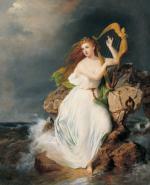 The Harp of Erin, by Thomas Buchanan Read, 1867. Read enjoyed associating with the best minds and talents of his day, and used the income from his successful career as a sculptor and one of the nation's best-known portrait painters and poets to move frequently. In 1841 he relocated to Boston where his friends included painter Washington Allston and poet Henry Wadsworth Longfellow, whose patriotic works resembled his own. Philadelphia became his home in 1846, although in 1850 he moved to Rome where he opened a studio. There he wrote the poem "The New Pastoral" which exhibits a fondness for "Fair Pennsylvania". During the American Civil War, he returned from Europe and became a major in the Union army, serving on the staffs of General Lew Wallace - future author of the novel Ben Hur - and William Rosecrans. After the war, Read returned to Italy, where he continued to paint, write patriotic poetry, and associate with other English-speaking artists and writers. In addition to painting patriotic and American themes, in his last years he painted dreamy, nostalgic works influenced by the pre-Raphaelites, including "A Painter's Dream" (Detroit Institute of the Arts) in which a floating Venus inspires the artist, and "Hiawatha's Wooing." 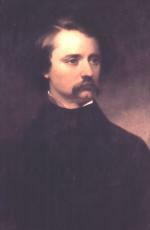 His poems, including "The Wagoner of the Alleghenies," "The Oath," and "The Defenders" were so popular in the United States that five of them were excerpted in the first volume of Bartlett's Familiar Quotations. Despite his contemporary fame, however, Read is remembered today almost solely for his poem and portrait depicting Sheridan's Ride. George Norman Highley, T. Buchanan Read: Artist, Poet, Sculptor (Malvern, Pa: George Norman Highley), 1972. Gene D. Lewis, ed., "Personal Recollections and Anecdotes of Thomas Buchanan Read," Cincinnati Historical Society Bulletin :23:4 (1965): 273-285.